Shafilea Iftikhar Ahmed, 17, UK. A bright and ambitious 17-year-old, Shafilea desired nothing more than to attend law school, but her parents had other plans for their daughter. Soon, a girl’s dreams of a career in justice spiraled into an unjust series of mysterious disappearances and violence. The Ahmed family lived in Warrington, England, and Iftikhar Ahmed, Shafilea’s father, even stated to investigators “I’m as English as anybody can be.” He claimed that he was happy with his daughter’s Western tastes in music and fashion. Nobody knows exactly what sparked the conflict in the Ahmed family, but it is believed that Shafilea’s educational aspirations and fears of arranged marriage are what led to her murder. In Fall of 2002, Shafilea confessed to her professors that she was being held against her will at home. Her teachers talked to Iftikhar and Faranza Ahmed. Though her parents allowed her to go to school again, Shafilea ran away multiple times and eventually registered as being homeless. She admitted her parents beat her, stole money from her bank account and would likely force her into an arranged marriage. She also wrote poetry about her family issues to cope with the pain. After months of being homeless, Shafilea returned home, and the family left for a holiday in Pakistan in February, 2003. During this trip, Shafilea’s parents introduced her to a potential husband. While in Pakistan, Shafilea drank bleach and seriously damaged her throat. Her parents claimed this cry for help was simply an accident. Once she was back in Warrington, Shafilea only left the house for medical treatment until she started her A-Levels at college in September. Shafilea went missing just over a week into the semester, and a former professor contacted authorities on September 18, 2003. 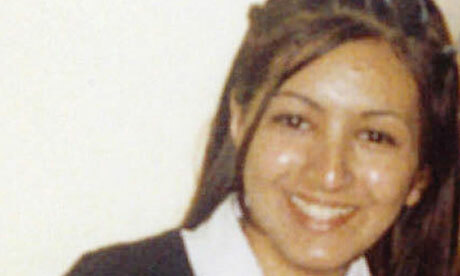 In February, 2004, Shafilea’s body was found on the banks of the River Kent in Cumbria, after mass flooding in the area. The corpse had been deliberately hidden but was washed onto the shore and found by three workmen, according to police. Dismembered and badly decomposed, the body was identified as Shafilea weeks later, based on dental records and a gold bracelet and topaz ring found with the body. Two post mortem reports concluded that Shafilea was the victim of a “vile murder,” likely from strangulation or suffocation. 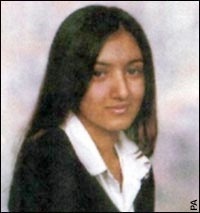 In December 2004, English writer, actor and dancer Shobna Gulati joined forces with the investigation team to find answers to Shalfiea’s mysterious murder and did a public reading of Shlfiea’s poems, depicting the feelings of despair and hopelessness during the months before her disappearance. Iftikar and Faranza Ahmed were arrested on suspicion of their daughter’s murder along with five family members in December 2003 but were released due to lack of evidence. In September 2010, Shalifea’s parents were arrested again, under suspicion of committing the honor killing. “I feel trapped. All they think about is honour, I was like a normal teenage kid, didn’t ask 2 much, I just wanted to fit in, but my culture was different. Now I’m sitting here playing happy families still crying tears”. I’m trapped so trapped I’m trapped wit u. (I don’t know wot do) I feel trapped. justice will be done shafilea i had the displeasure of working with your dad.he was everything wrong in a multicultural society.he never had any respect for women he was a nasty vindictive liar and he and those responsible will be judged.and hopefully the truth and justice will finally be done and you can rest in peace.as a father with young daughters i find it hard to put into words how much it hurts to hear how you was treated by the people that are supposed to love and protect you.whatever the religion or beliefs nobody deserves to suffer like you have.sweetdreams angel they never deserved you. I watched your story on crime watch last night, it was heart breaking.